Pope Francis at Dublin Airport today. Pope Francis is expected to meet survivors of clerical abuse during his two-day visit. POPE FRANCIS HAS acknowledged the abuse suffered by people at the hands of the Catholic Church in Ireland. However, he failed to apologise to abuse survivors when delivering a keynote speech at an event at Dublin Castle this afternoon. The pontiff said: “I am very conscious of the circumstances of our most vulnerable brothers and sisters – I think especially of those women who in the past have endured particularly difficult situations. “With regard to the most vulnerable, I cannot fail to acknowledge the grave scandal caused in Ireland by the abuse of young people by members of the Church charged with responsibility for their protection and education. “The failure of ecclesiastical authorities – bishops, religious superiors, priests and others – adequately to address the repellant crimes has rightly given rise to outrage, and remains a source of pain and shame for the Catholic community. I myself share those sentiments. “My predecessor, Pope Benedict, spared no words in recognising both the gravity of the situation and demanding that “truly evangelical, just and effective” measures be taken in response to this betrayal of trust. Colm O’Gorman, Director of Amnesty International Ireland and clerical abuse survivor, was at the event at Dublin Castle. 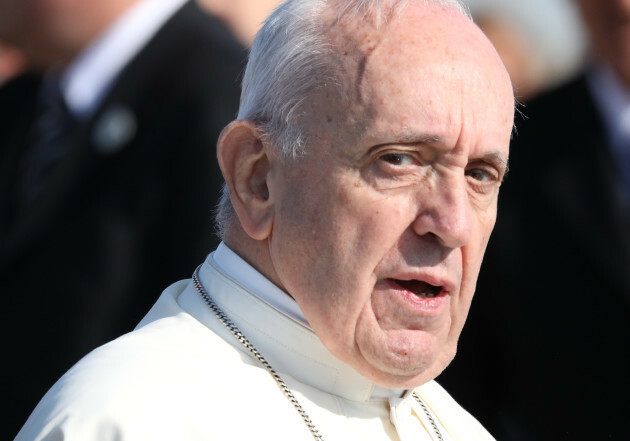 He was sharply critical of the pope’s speech, describing it as “extraordinary deflection”. This was perhaps the most appropriate opportunity for Pope Francis to speak directly to the State, but more importantly to the Irish people. To finally acknowledge the proven truth of Vatican’s role in the cover up of crimes perpetrated against so many people here. “He failed to do so. Instead Pope Francis speaks of the pain and shame of the “catholic community”, and then says he shares those sentiments. In doing this, he continues to suggest that such shame should be carried by the faithful of the church, by ordinary Catholics,” O’Gorman tweeted. At the same event, Taoiseach Leo Varadkar said there is “much to be done” to bring about justice and healing for survivors of clerical abuse. Pope Francis is expected to meet survivors during his two-day visit. Details of that meeting will not be announced until after it has taken place, the Vatican has said. The pontiff wrote a letter during the week asking for forgiveness from abuse victims. You can follow the latest updates from his visit here. Hundreds of thousands of people are expected to attend Papal events this weekend, with up to 500,000 due to attend a Mass in the Phoenix Park tomorrow. At the beginning of my visit to Ireland, I am grateful for the invitation to address this distinguished assembly representing the civil, cultural and religious life of the country, together with the members of the diplomatic corps and guests. I appreciate the friendly welcome I have received from the President of Ireland, which reflects the tradition of cordial hospitality for which the Irish are known throughout the world. I likewise appreciate the presence of a delegation from Northern Ireland. As you know, the reason for my visit is to take part in the World Meeting of Families, held this year in Dublin. The Church is, in a real way, a family among families, and senses the need to support families in their efforts to respond faithfully and joyfully to their God-given vocation in society. The Meeting is not only an opportunity for families to reaffirm their commitment to loving fidelity, mutual assistance and reverence for God’s gift of life in all its forms, but also to testify to the unique role played by the family in the education of its members and the development of a sound and flourishing social fabric. I would like to see the World Meeting of Families as a prophetic witness to the rich patrimony of ethical and spiritual values that it is the duty of every generation to cherish and protect. One need not be a prophet to perceive the difficulties faced by our families in today’s rapidly evolving society, or to be troubled by the effects that breakdown in marriage and family life will necessarily entail for the future of our communities at every level. Families are the glue of society; their welfare cannot be taken for granted, but must be promoted and protected by every appropriate means. It was in the family that each of us took his or her first steps in life. There we learned to live together in harmony, to master our selfish instincts and reconcile our differences, and above all to discern and seek those values that give authentic meaning and fulfilment to our lives. If we speak of our entire world as a single family, it is because we rightly acknowledge the bonds of our common humanity and we sense our call to unity and solidarity, especially with the weakest of our brothers and sisters. Yet all too often, we feel impotent before the persistent evils of racial and ethnic hatred, intractable conflicts and violence, contempt for human dignity and for fundamental human rights, and the growing divide between rich and poor. How much we need to recover, in every instance of political and social life, the sense of being a true family of peoples! And never to lose hope or the courage to persevere in the moral imperative to be peacemakers, reconcilers and guardians of one another. Here in Ireland, this challenge has a special resonance, in light of the long conflict that separated brothers and sisters of a single family. Twenty years ago, the international community followed attentively the events in Northern Ireland that led to the signing of the Good Friday Agreement. The Irish government, in union with the political, religious and civil leaders of Northern Ireland and the British government, and with the support of other world leaders, created a dynamic context for the peaceful settlement of a conflict that had caused untold pain on both sides. We can give thanks for the two decades of peace that followed this historic agreement, while expressing firm hope that the peace process will overcome every remaining obstacle and help give birth to a future of harmony, reconciliation and mutual trust. The Gospel reminds us that true peace is ultimately God’s gift; it flows from a healed and reconciled heart and branches out to embrace the entire world. Yet it also requires constant conversion on our part, as the source of those spiritual resources needed to build a society of authentic solidarity, justice and service of the common good. Without that spiritual foundation, our ideal of a global family of nations risks becoming no more than another empty platitude. Can we say that the goal of creating economic prosperity leads of itself to a more just and equitable social order? Or could it be that the growth of a materialistic “throwaway culture” has in fact made us increasingly indifferent to the poor and to the most defenceless members of our human family, including the unborn, deprived of the very right to life? Perhaps the most disturbing challenges to our consciences in these days is the massive refugee crisis, which will not go away, and whose solution calls for a wisdom, a breadth of vision and a humanitarian concern that go far beyond short-term political decisions. I am very conscious of the circumstances of our most vulnerable brothers and sisters – I think especially of those women who in the past have endured particularly difficult situations. With regard to the most vulnerable, I cannot fail to acknowledge the grave scandal caused in Ireland by the abuse of young people by members of the Church charged with responsibility for their protection and education. The failure of ecclesiastical authorities – bishops, religious superiors, priests and others – adequately to address these repellent crimes has rightly given rise to outrage, and remains a source of pain and shame for the Catholic community. I myself share those sentiments. My predecessor, Pope Benedict, spared no words in recognising both the gravity of the situation and in demanding that “truly evangelical, just and effective” measures be taken in response to this betrayal of trust. His frank and decisive intervention continues to serve as an incentive for the efforts of the Church’s leadership both to remedy past mistakes and to adopt stringent norms meant to ensure that they do not happen again. Each child is in fact a precious gift of God, to be cherished, encouraged to develop his or her gifts, and guided to spiritual maturity and human flourishing. The Church in Ireland, past and present, has played a role in promoting the welfare of children that cannot be obscured. It is my hope that the gravity of the abuse scandals, which have cast light on the failings of many, will serve to emphasise the importance of the protection of minors and vulnerable adults on the part of society as a whole. In this regard, all of us are aware of how urgent it is to provide our young people with wise guidance and sound values on their journey to maturity. Dear friends, almost ninety years ago, the Holy See was among the first international institutions to recognise the Irish Free State. That initiative signalled the beginning of many years of dynamic cooperation and harmony, with only an occasional cloud on the horizon. Recently intensive endeavour and goodwill on both sides have contributed significantly to a promising renewal of those friendly relations for the mutual benefit of all. The threads of that history reach back to over a millennium and a half ago, when the Christian message, preached by Palladius and Patrick, found a home in Ireland and became an integral part of Irish life and culture. Many “saints and scholars” were inspired to leave these shores and bring their newfound faith to other lands. To this day, the names of Columba, Columbanus, Brigid, Gall, Killian, Brendan and so many others are still revered throughout Europe and beyond. On this island monasticism, as a source of civilization and artistic creativity, wrote a splendid page in Irish and universal history. Today as in the past, the men and women who live in this country strive to enrich the life of the nation with the wisdom born of their faith. Even in Ireland’s darkest hours, they found in that faith a source of the courage and commitment needed to forge a future of freedom and dignity, justice and solidarity. The Christian message has been an integral part of that experience, and has shaped the language, thought and culture of people on this island. It is my prayer that Ireland, in listening to the polyphony of contemporary political and social discussion, will not be forgetful of the powerful strains of the Christian message that have sustained it in the past, and can continue to do so in the future. With these thoughts, I cordially invoke upon you, and upon all the beloved Irish people, God’s blessings of wisdom, joy and peace. Thank you.